Following his defeat at Leipzig on 16-19 October 1813 Napoleon’s army was forced to retreat from Germany. He managed to get about 70,000 formed troops and 40,000 stragglers across the Rhine after winning the Battle of Hanau on 31 October, but he lost almost 300,000 men in Germany in 1813, with another 100,000 trapped in isolated garrisons. In the south Wellington’s army of British, Portuguese and Spanish troops had crossed the River Bidassoa into France on 7 October, and by 10 November were across the Nivelle. The Coalition facing Napoleon had different objectives. The Austrians were the most willing to negotiate. Emperor Francis I of Austria was Napoleon’s father-in-law. More significantly, his chief minister, Prince Klemens Metternich was concerned that the overthrow of Napoleon would boost German nationalism, which he feared would weaken Austria’s position in central Europe. Tsar Alexander I of Russia was, according to David Chandler, ‘in two minds’ about whether to avenge Napoleon’s occupation of Moscow in 1812 by occupying Paris or to stop a war in which Russia now seemed to be fighting for the benefit of others, but ‘[o]n balance…favoured action.’King Friedrich Wilhelm III of Prussia tended to follow the Tsar’s lead, but many of his countrymen wanted revenge for past defeats and humiliations at the hand of Napoleon. Bernadotte, once one of Napoleon’s marshals and now Crown Prince of Sweden, dreamed that he might replace Napoleon as ruler of France. The British, concerned with the balance of power in Europe, were willing to leave Napoleon on the throne of France provided that it was restricted to its natural frontiers, excluding Antwerp and the Scheldt. The Emperor gave a favourable verbal response to the envoy who brought them to him, but his initial written reply did no more than propose new peace talks, suggesting that he was just playing for time in order to build up his forces. The British insisted that nothing more should be done until Lord Castlereagh, the Foreign Secretary, arrived. The Coalition plan was complex. Bernadotte’s Army of the North, less General Friederich von Bülow’s corps, would continue the siege of Magdeburg, surround Hamburg and threaten Denmark. Bülow’s corps, supported by a British expeditionary force under General Sir Thomas Graham would move into Holland which had revolted against France rule, take Antwerp and invade France through Belgium. The main attack would come from the 200,000 man Army of Bohemia, commanded by Prince Karl Philip zu Schwarzenberg, but accompanied by Alexander and Friedrich Wilhelm. It would move from Basle to Colmar, cross the Rhine and advance to the Langres Plateau. It would then attack the French right whilst Napoleon’s centre was pinned by Prince Gebhard von Blücher’s 100,000 strong Army of Silesia, which was to cross the Rhine between Coblenz and Mannheim. Schwarzenberg’s army would link up with Austro-Italian troops that were moving on Lyon, whilst Wellington’s army would advance north from the Pyrenees. By the middle of February there would be nearly 400,000 Coalition troops in France. The Coalition plan was the one that had worked in Germany the year before. Fortresses should be masked rather than besieged. Its armies should manoeuvre against the enemy’s flanks and lines of communication, forcing Napoleon to respond to these threats. The Coalition would attack only when it heavily outnumbered the enemy. If one Coalition army was attacked by a large enemy force it would retreat, and the other Coalition army would advance. Against this there were only 67,000 French soldiers on the frontier from Strasbourg to the North Sea. Napoleon called up 936,000 men, but many evaded conscription, and less than 120,000 of them served in the 1814 campaign. There was a shortage of equipment for those who did report for duty and a lack of NCOs and junior officers to command them. Napoleon was forced to use invalids and pensioners as leaders of even Imperial Guard formations. The Emperor attempted to find troops from his Spanish and Italian allies, but the only ones that he obtained were some veteran troops from the French armies facing Wellington. His position was further weakened by the defections of the King of Naples, his brother-in-law Joachim Murat, on 11 January, and the King of Denmark 3 days later. Blücher’s Army of Silesia crossed the Rhine on 29 December 1813, followed by Schwarzenberg’s Army of Bohemia on 1 January 1814. Blücher’s army moved 75 miles in nine days, and had crossed the Marne by 22 January. The next day its advance guard took a bridgehead over the Meuse. The cautious Schwarzenberg moved more slowly, but reached his initial objective of the Langres Plateau on 17 January. He then halted for six days because there were suggestions of a new peace conference. By 23 January the flanks of the two Coalition armies were only two days march apart. Napoleon had hoped that his frontier forces would delay them more, enabling him to build up his army. He now had to take personal command of the field army. On 25 January he left Paris to start his 1814 campaign. D. Chandler, The Campaigns of Napoleon (London: Weidenfeld & Nicolson, 1966), p. 947. C. J. Esdaile, Napoleon’s Wars: An International History, 1803-1815 (London: Allen Lane, 2007), p. 517. Quoted in Chandler, Campaigns, p. 948. Esdaile, Napoleon’s Wars, pp. 515-16. Troop strengths are from Chandler, Campaigns, pp. 948-50. F. L. Petre, Napoleon at Bay 1814 (London: John Lane, The Bodley Head, 1914), p. 3. The Coalition opposing Napoleon based their strategy for the Autumn 1813 campaign in Central Europe on the Trachenberg Plan, which stated that their armies should retreat if faced by the main French army under his personal command. They should attempt to defeat detached French corps and to cut Napoleon’s lines of supply. Napoleon, however, was not worried about being cut off from France provided that he retained control of Dresden. He had established a large supply base there during the period between the signing of the Truce of Pläswitz on 4 June 1813 and the recommencement of hostilities on 16 August. At the start of the Autumn campaign Napoleon moved eastwards with the intention of defeating Prince Gebhardt Blücher’s Army of Silesia, which was advancing towards Saxony. 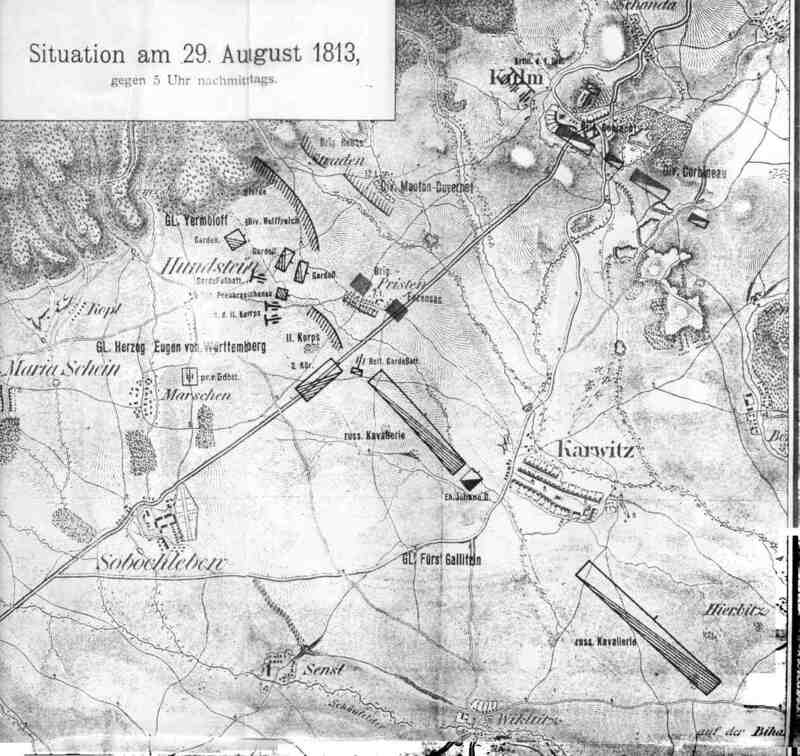 On August 21 Blücher learnt that he faced Napoleon, so retreated in accordance with the Trachenberg Plan. Napoleon continued to advance for another day, but then received a message from Marshal Laurent St Cyr warning him that Dresden was threatened by Prince Karl Philip zu Schwarzenberg’s Army of Bohemia. Napoleon saw an opportunity to defeat the Army of Bohemia, the largest of the three Coalition armies in Central Europe: the other was Bernadotte’s Army of Northern Germany. Napoleon therefore turned the bulk of his army back towards Dresden, taking the Imperial Guard (Marshal Adolphe Édouard Mortier), I (General Dominique Vandamme), II (Marshal Claude Victor) and VI Corps (Marshal Auguste Marmont) and the 1 Cavalry Corps. The Army of Bober under Marshal Jacques MacDonald was left to guard his eastern flank. 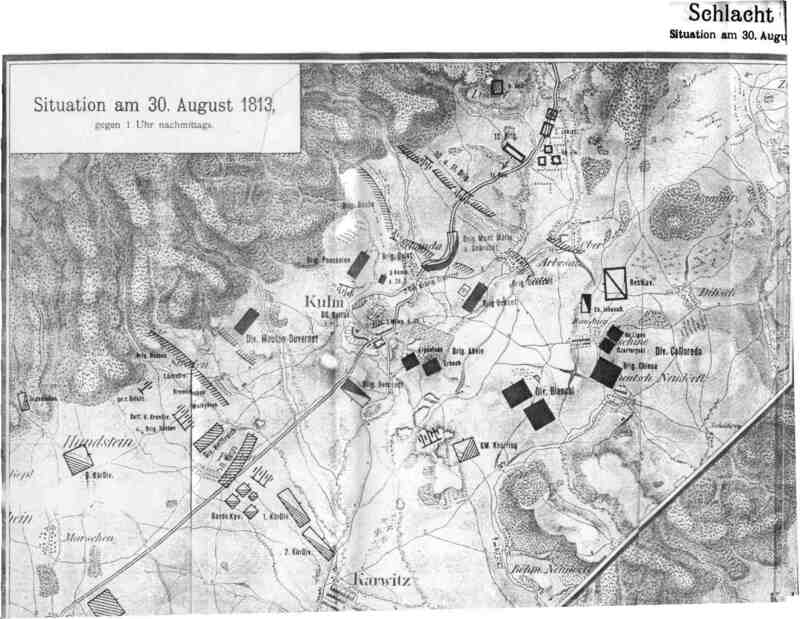 Napoleon planned to attack Schwarzenberg’s communications on 26 August and inflict a decisive defeat on the Army of Bohemia, which was spread out and vulnerable. This meant that his troops would have to march 120 kilometres between 22-26 August. This was beyond the capabilities of the Austrian Army, so Schwarzenberg did not consider the possibility that he might find himself facing Napoleon at Dresden. 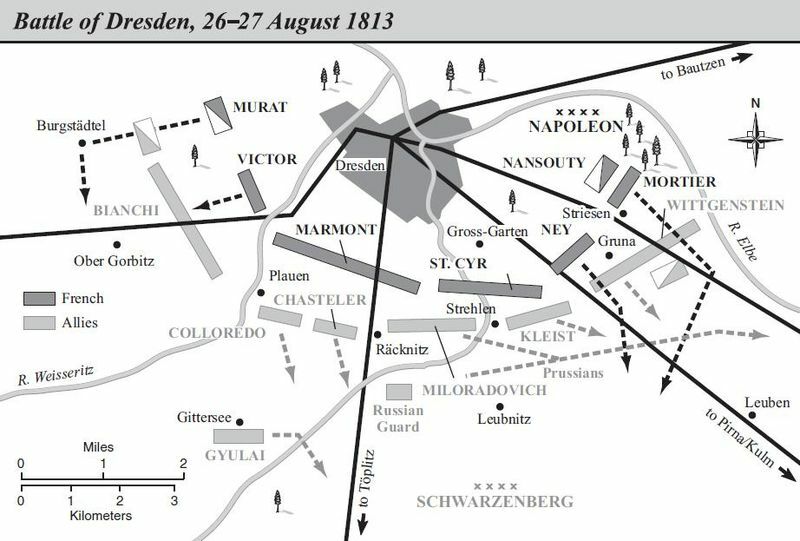 Late on 25 August, however, Napoleon was informed by General Gaspard Gourgaud, who he had sent to inspect the defences of Dresden, that it would fall within a day unless St Cyr’s XIV Corps was reinforced. Napoleon called off the attack early the next day and ordered most of his army to march to Dresden. Vandamme’s corps was to attack the Army of Bohemia’s rear. This was a decisive mistake by Napoleon. He sent more troops to Dresden than were needed to hold it, and fewer with Vandamme than were required to carry out his plan of destroying the Army of Bohemia by attacking its rear. St Cyr had established a line of improvised outposts on the outskirts of Dresden, based on the cover provided by walled gardens, houses and barricades. Five earthen artillery redoubts were constructed behind this line, but three of them could not support each other, and another had a restricted field of fire. Further back were the fortifications of the Altsadt, or old town, which had been partly rebuilt after the French captured the city earlier in the year. The Army of Bohemia attacked Dresden on the morning of 26 August. Fighting died down by noon, by when the French had been pushed back to the redoubts. By 11am the Coalition commanders, including the Russian, Austrian and Prussian monarchs, had taken up a position on the Räcknitz Heights, from where they could see French reinforcements arriving. Shouts of ‘Vive l’Empereur’ were heard by the Coalition troops, revealing that Napoleon was present. The main attack by the Coalition was planned for 4pm. Tsar Alexander I of Russia wanted to call it off in accordance with the Coalition strategy of avoiding battle with Napoleon himself. Emperor Francis I of Austria declined to offer an opinion, but King Friedrich Wilhelm III of Prussia wanted to fight on, since the Coalition had a numerical advantage of 158,000 to 70,000. Schwarzenberg was ordered to postpone the main assault until the monarchs could agree, but the new orders were transmitted slowly, and the attack went ahead. Napoleon left St Cyr in charge of the defence, which held, and formed three counter-attacking forces under Marshal Joachim Murat, Marshal Michel Ney and Mortier. Napoleon launched his counter-attack at 5:30pm. By dark the French had retaken almost all of the line of outposts that they had held at the start of the day. Napoleon was reinforced by Marmont and Victor’s corps overnight, taking his force to 120,000. The Army of Bohemia’s strength also increased, but only to 170,000 as potential reinforcements did not arrive. Vandamme had crossed the Elbe with 40,000 men, forcing the 12,500 men of Eugen of Württemberg back. They were reinforced by 26,000 troops under General Alexander Ostermann-Tolstoy, preventing Vandamme from threatening the Army of Bohemia’s flank. Napoleon, however, intended to hold the centre with 50,000 troops under Marmont and St Cyr, and to carry out a double envelopment, with 35,000 men on each flank. Murat commanded on the right and Ney and Mortier on the left. Both French flank attacks went well: on their right the French took 13,000 prisoners from the Coalition’s left flank force. The French were hard pressed in the centre where they were considerably outnumbered. However, the Coalition cancelled an attack intended to create a gap between the French centre and left flank because the rain had created mud that made it impossible to bring up artillery. Faced with defeat on both flanks and a threat from Vandamme to their rear, the Coalition commanders decided to withdraw overnight. Their morale cannot have been helped by a cannonball that nearly hit the Tsar. They had suffered 38,000 casualties and inflicted only 10,000. An aggressive French pursuit could have turned a major victory into a rout that would have ended the campaign. If Vandamme could had beaten the Army of Bohemia to Teplitz it would have been trapped. The prediction had taken less than a fortnight to come true. Napoleon left the pursuit to his subordinates, which meant that it was not well co-ordinated. Vandamme became isolated, and on 29 August was forced by Ostermann, who now commanded 44,000 troops, to fall back to Kulm. The next day the Coalition enveloped Vandamme by chance, when 12,000 retreating troops under General Friedrich von Kleist stumbled into the rear of I Corps. The majority of its troops managed to escape, but 13,000, including Vandamme, were captured. Napoleon won a great victory at Dresden, but the changes to his original plan, a tardy pursuit and defeats elsewhere meant that it was not a war winning victory. The Coalition plan of avoiding battle with Napoleon, but seeking it with his subordinates was working: Napoleon had won the only battle in the campaign so far at which he been present, but the Coalition had won the other three. D. Chandler, The Campaigns of Napoleon (London: Weidenfeld & Nicolson, 1966), p. 906. D. C. B. Lieven, Russia against Napoleon: The Battle for Europe, 1807 to 1814 (London: Penguin, 2010), p. 395. Troop numbers are from Chandler, Campaigns, pp. 906-12. Quoted in Ibid., p. 903; M. V. Leggiere, Napoleon and Berlin: The Franco-Prussian War in North Germany, 1813 (Norman: University of Oklahoma Press, 2002), p. 136; and F. L. Petre, Napoleon’s Last Campaign in Germany, 1813 (London: Arms and Armour Press, 1974, first published 1912), p. 178.